Werewolves of London come to huff 'n' puff and generally blow your house down. My Love Is Cool is a real beast of a debut. In the best possible way. It literally roars with feverish, feral relish. It could've gone either way though. This London quartet led by Packmaster Ellie "GRRR!" Rowsell have been riding that ol' choo-choo train called "hype" for seemingly forever thanks to the promise and prayer of their Blush and Creature Songs EPs. Well, once bitten twice shy. We all know from bitter experience this rock n' roll highway's jammed with broken heroes and sham saviours sent from the Smoke. Within the footprints of Wolf's juvenilia also lay some silver bullet suspicions about what truly lay beneath the skin of these new bloods. Were they Folksters? Hipsters? Headbangers? Pop tarts? SHEEP?!? Cool could've so easily arrived with "Approach with Caution!" stamped on it. But curses be damn'd! Lycanthropes crack open the full moon fever! There's nothing to fear here but fear itself... the fear of having your face melted off that is. Our tale begins relatively peacefully. The enchanting entrée "Turn To Dust" howls yes, but more like wind than wolf. All pagan-pastoral, folk flutter from ye olde times. "Keep your beady eyes on me," Rowsell demands sounding somewhere between eight and eight hundred years old. "Make sure I don't turn to dust". A murder of crows and possibly the spirit of Jimmy Page circle overhead. The charming "Bros" throws another early curve ball. The poppiest Cool thing it sparkles like a sugar spun sister of the Cranberries' lost treasure "Dreams". A pinky promise for forever friends it swoons euphoric. "Are your lights on? Are your lights still on?" it begs, spinning heady toward its "Me and you" forever-ever, forever-ever fade. It's around this point Cool bares its teeth. Big. Bloody. Teeth. "Your Love's Whore" streamrollers into town like the Pumpkins, My Bloody Valentine or even early Suede at their most raucous. "I got tricks" it quips. No doubt. The verses rumble and tumble wistfully enough 'til the nuclear chorus sweeps the skyline with a blinding mushroom cloud of white noise. It's the first time you'll witness Rowsell's transmogrification from ornate English Rose to soul-swallowing Banshee. "Waaa-ha-hAAAA! Now I am your love's whore!" Equally bone-rattling is last year's breakthrough "Moaning Lisa Smile" which packs enough "Boom!" to blow any little pig's house down and when Rowsell unleashes her "AahAH! AHaHhh!" maniacal caterwaul she sounds like nothing but mighty Layne Staley reborn. Mother see, chaos can be fun. In the heart of Cool there's a riot goin' on. The Hole-shaped "You're a Germ's" lambast of "A dodgy fucker" who likes 'em "pure" is vitriolic, creepy and unhinged. The sound of Rowsell running with scissors into a countdown-chorus cut for stagediving, bloody noses and broken teeth. "You ain't going to heaven cos I'm dragging you down to hell" it claws. Then "Lisbon" double dips a breezy Blondie-bleached pop melody in napalm and tells you to "Swallow the fear". One last kiss goodbye, "Deeper than death I would wait for you there". Elsewhere recent single "Giant Peach" is so "Big Rock" you could do the Angus Young Duck Walk to it. A Hammerhead, 'Smash-it-up!' salute to their beloved hometown. Rowsell's loco "Mike Patton is Travis Bickle in Exorcist 5" changeling vocals are a thing of unholy wonder. The band's calling card -- the demented delinquent named "Fluffy" -- gets another chance at parole too. "16! SO SWEEEET!" For the uninitiated, picture Alice Glass singing Sonic Youth whilst fueled solely by Vodka. Jeeves, fetch the straitjacket! Inexplicably, the lovely, lilting "Freazy" skips inbetween the hoopla, echoing the Sundays at their most summery, shuffley and rapturous. "You can join us if you're a feral child! Our love is cool!". It's sweet and smiley but you'll be wise to sleep with one eye open. Remember kids, "Sweetest tongue has sharpest tooth". Expect the unexpected! Keep watch for the shapeshifter! The moonlit, ambient throb of "Silk" feels like Metric covering Springsteen's "I'm on Fire" for the Drive soundtrack. A neon loneliness ballad of pain and paranoia for a "Half human creature" whom "God never reached". "Swallowtail" is an even stranger curio. A tale of devils and descent looped in a triptych with each reprise bringing a more intensely, claustrophobic return. Drummer Joel Amey's gentle vocal slow drowns before a "Release the BATS!" gonzo implosion. The lush, sci-fi twinkle of "Soapy Water" may offer some signs to Wolf Alice's next incarnation. "Nothing heals misery's fist" it fizzes and floats cryptically like an anaesthetised Shirley Manson locked in a thousand yard stare. But despite all the exuberant 'appetite for destruction' My Love Is Cool is ultimately pulled from us clinging for life and fearful of the future. The dreamy curtain-closing cinematics of "The Wonderwhy" call out "Don't leave me here!" not with ravenous rage but forlorn fragility. Who ever knew a wolf could cry? Love bites! 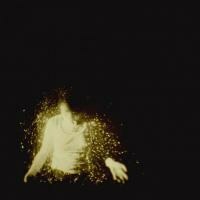 Wolf Alice's firstborn digs its sharp claws right under your skin. Let it gouge away. It's a real rush. My Love Is Cool is no pioneering sonic masterpiece, no, but it's definitely possessed with that ol' black magic snap, the "electric kick" that might just inspire other manic street creatures to ignite a guitar and exorcise their own demons. This incendiary infection, pass it on.